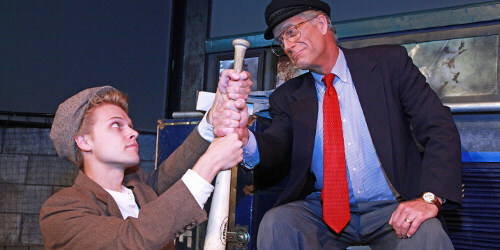 I had the pleasure of reviewing the premiere of Detroit Free Press columnist Mitch Albom’s homage to broadcasting legend Ernie Harwell in 2011. I wrote then that “Perhaps we can look forward to its return in future springs.” And so it did. But if “Ernie” is opening closer to the All-Star Game than to Opening Day this year, it played successfully in Lakeland, Florida during the Tigers’ spring training. But Harwell was not only “The Voice of the Tigers” for 42 years; he was the “Voice of Summer” for Detroit sports fans. I associate his warm voice with the blazing heat of a Michigan summer than with the dreary, wet Michigan spring. Any time is the right time to remember a quiet, gentle, decent man. The date of Opening Night has changed, but little else. “Ernie” plays at The City Theatre, inside Hockeytown Cafe, directly across Woodward from Comerica Park. It still can boast about Kirk Domer’s disheveled scenic design that recreates a field access tunnel at the stadium. The startling lighting and sound designs by Dan Walker and Steve Shannon, respectively, effectively enliven the performance. Best of all, Alison Dobbins’ remarkable video designs recreate the highlights from over 80 years of “America’s Pastime” through archival photos and film footage provided by Major League Baseball. Timothy “TJ” Corbett returns as the “Boy,” a teen of indeterminate age but boundless enthusiasm. The fact that Corbett was an adult when he assumed the role and is now older still doesn’t show. His use of vocal inflection and body language might make his next role Peter Pan. The story is deceptively simple. It is the evening of Sept. 16, 2009. A reluctant Ernie Harwell has come to the stadium for one last thank you from an adoring city – Ernie is dying of cancer. To add insult to injury, it’s pouring, and the storm has blacked out first the scoreboard and then the stadium lights. Harwell’s aphorism, “Sometimes you win, sometimes you lose, sometimes it rains” is a recurring observation. His nervous pacing is interrupted by a boy, clothed in knickers and po’boy hat, who is elusive about his identity, but is more than just a routine fan. The persistent pest coaxes Harwell to “make one last broadcast” and call his life story. “Ernie” is a play in nine innings. One more personage remains the same for 2014 – director Tony Caselli. To him goes the credit for “Ernie” remaining a consistent fan favorite. It’s appealing entertainment for theater fans, and yet still pleases sports fans. In short, as we say in show biz, this show’s got legs, and I predict that “Ernie” won’t be retiring at the end of the season.